What are your fav combos? Post some of the combos you have come out with, or often use. I like Belly Drum the most though I don't bother with Rest, just whip on a Salac Berry and a have a good EV spread and can finish them without the enemy even having a go, well maybe one at the start. I prefer RD/Thun over SB/SD because when a Grass Pokemon casts SunnyDay it is just calling for a fire attack against them. With Raindance that doesn't happen. I don't really do many combos, just Parattract. I like Rain Dance then Thunder...much better than all the others. But the best combo ever is parattractafusion. Like in my . Greatest annoyer ever! I personally like, for 2vs2 purposes, a pokemon with Guts + Facade (Like Ursaring), then having its partner poison (regular poison, like poisonpowder, not toxic) that pokemon. Guts doubles attack when under poison, burn, or paralysis, and facade doubles base power under the same circumstances. plus STAB on Ursaring, that makes for one powerful blow. Plus, normal weak poison prevents things like Toxic, Paralysis, or Sleep. I had a GSC Jumpluff once that had Attract, Stun Spore, Leech Seed, and Headbutt. It was really annoying. I liked that combo a lot. Second place is Belly Drum+Rest, third is Focus Energy+Scope Lens+anything with a high Critical hit ratio. *cough* . . .
My band, from dust. CAUTION: Not hipster-approved. I like Sunny Day with Solar Beam, especially in some of my 2v2 battles. I use for Sunny Day and as the benefiter for the Sunny Day. Another reason why Sunny Day is good for this team is because Blaziken gets nice fire damage added. 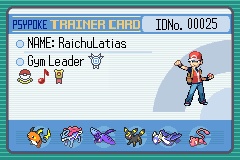 Roselia is a great team player as well because she can learn Aromatherapy, which helps alot, since most of my opponents go after Blaziken to get rid of him. I like Defense Curl + Rollout. Does it still work? The only time I use it was in GSC. In 2v2, I'm all about the Explode and 'shield' combo. A speedy bomber that pumps attack (while his partner lays a defense) and then explodes (while his partner shields) is choice. Really sways things your way from the start. Oh? This sounds cool. Please share how you do it. Last edited by leet for on Sun Dec 19, 2004 5:11 am, edited 1 time in total. Send out a Mew and a Celebi. (using these two just for ease of explanation) Mew does Swords Dance; Celebi does any of Reflect, Leech Seed, Light Screen, etc. Next turn, Mew uses Explosion while Celebi Protects. Ohhh... I see. Sounds cool. 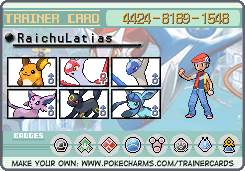 Well, I will probably use Forretress with Alakazam instead. Although... is Leech Seed necessary? The point is just to give yourself a setup that benefits both your active Pokemon - post-Explosion. And I'm not sure why I said seed, as it would be nullified by Exploding (and knocking out) the opposing Pokemon. Oh ok, cool. Thanks for the tip. Personally, I like Encore + Levitate! though your opponent's Dugtrio knows Ancientpower to knock out Charizard, it can't use it! Then just knock it out with a One-Hit-KO Blast Burn! I had an annoying Cacturne. It had Ingrain, Leech Seed, Needle Arm, Hidden Power Water. Item was Leftovers. My favorite is a sleep inducing attack and a one hit K.O. I had a use the combo Lock-on and Fissure, nasty combo indeed. papersun sent out Dugtrio (or whatever)! (Assuming Smeargle survives) papersun withdrew Dugtrio and sent out Ninetales! This topic should be closed, it's old-school. Or I believe the word was necromancy? Yay, my is a Critiken!